During early stages of development, precursor B lymphocytes express a characteristic type of antigen receptor known as the pre-B-cell receptor (pre-BCR). 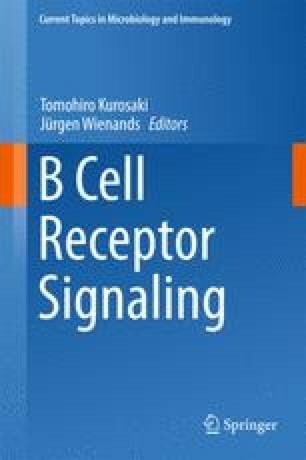 This receptor differs from conventional BCRs in that it possesses a germ line-encoded surrogate light chain (SLC), which is associated with the signal transduction machinery via heavy chain (HC) proteins that have been generated by productive rearrangement of the immunoglobulin HC genes. The pre-BCR marks a key step of B-cell commitment, as it activates the B-cell-specific signaling cascade and mediates the selection, expansion, and differentiation of cells expressing a productively rearranged HC protein. Another difference between the pre-BCR and conventional BCR might be the initial event that triggers receptor activation, as the pre-BCR is activated in the absence of external ligands, while conventional BCRs require antigen for activation. Nonetheless, the pre-BCR downstream signaling cascade is largely similar to that of the BCR suggesting that the characteristic LC of the pre-BCR mediates important receptor interactions thereby providing distinctive, germ line-encoded features to the pre-BCR. In fact, the SLC enables the pre-BCR to act as a surrogate autoreactive receptor. Here, we outline the structure and function of the pre-BCR and how the autonomous signaling capacity might be a direct consequence of pre-BCR assembly. In addition to its role in early B-cell development, we discuss how the ordered activation of downstream signaling cascades enables the pre-BCR to activate seemingly opposing cellular programs such as proliferation and differentiation.